Venkatesh Iyer and Shivdas Menon, pals for a long time, co-founded Goli Vada Pav in 2004. Both of them worked together in the Corporate Financial Services space. Venkat describes their typical day – Talking to hundreds of business owners and understanding their business and their ideas, shortlisting the ones with a potential to grow big, and then approaching banks and financial institutions for raising finance by promoting their business idea. Venky describes himself as an avid story teller and always believed in the company’s story even when discussing fund raising with financial institutions. He says that while CAs talked about numbers and financial health of the companies, he spoke about the stories of companies that captured with his imagination. He recalls that in 1997, he spoke about modern retail to the banks and sold the idea of multiple retail outlets to various bankers and raised funds for some of well known retailers. Shiv, on the other hand, is a pro at building and maintaining relationships. Together they are an explosive combo. However, both friends wanted to start their own business. They were quite fascinated to the food segment but couldn’t decide what to do exactly specially because they didn’t have any experience in this sector. Venky recollects one day after a meeting, both of them stopped for a vada pav. The seller was frying hot vada pavs on a handcart right outside a global MNC chain of quick service restaurant. And people were actually queuing up to buy vada pavs. That moment stayed with him and thats when Venky and Shiv decided that they will open a national chain of QSR selling vada pavs. This street food which is loved by rich and poor alike has a mass appeal because of the ingredients used in it. Venky imagined if vada pav’s can be made in a centralized kitchen served by a uniformed staff in a hygienic store, this product has a potential to capture attention not only in India but even abroad. More than a decade later, Venky has been proved right. Goli Vada Pav’s first store opened in 2004 outside a busy Kalyan station, a distant suburb of Mumbai. The store was designed without a seating arrangement or an AC as the idea is to be selling food on-the-go. Though the area had many local vendors selling vada pavs on their handcarts but for the first time, there was a player selling hygienic vada pavs at pretty much the same price as the street vendor. Venky recalls that on the first day itself the customers queue went on till the end of the lane which validated their business idea. Over the next few days, the handcart guys approached Goli for a franchise as they knew now no one would buy their product specially when the price difference is just Rs 1. Though, the founding team knew in order to expand fast and become a national brand, franchise is the way forward. Kalyan being dominated by Sindhis who are known for their enterprising nature, signed up for Goli’s franchise. Venky says he got 300 inquiries for franchisees within the first week and unbelievably, it was the customers who have tasted Goli Vada Pav wanted to sign up for a franchise. Since the company couldn’t sign all 300 franchisees for the same location, they evaluated and chose 15. Within 3 weeks, Goli Vada Pav expanded to 16 locations. Venky says that this has been a pull factor and not a push factor to get franchisees. It was only the cities where they went for the first time, they had to conduct first round of meetings to rope in good quality franchise as the markets Goli entered had no vada pav store whether organised or unorganised. They have created this category in numerous markets like Interior Maharastra, Karnataka, Kerala, Kolkata etc. Venky knew that if these issues were not resolved then his dream of becoming a national QSR brand will never become a reality. He also knew that depending on people-centric solution will not address this problem thus he turned towards technology. The team tried different kinds of technologies available in the food space – X-rays to Nitrogen but in case of vada pav nothing worked. Venky recalls, “Obviously, trying out these technologies costed us a lot of money. 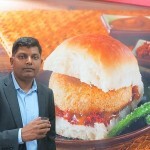 Our bankers’ confidence in us started to shake and they wanted us to shut down our business and return their money.” As a last shot to find the Holy Grail of food technology for vada pav, Venky connected with an MNC who makes frozen food for a leading QSR chain in the World. And as luck would have it, it worked. Goli Vada Pav has been prepared in a fully automatic plant near Mumbai ever since. This one tie-up eliminated every challenge that was stopping Goli from going national. An example of that is sponsoring Ganpati Mandals during 10-day long Ganesh festival in Mumbai. The company recorded a few songs on Goli by hiring upcoming singers and played it during morning and evening when there was a large crowd for Darshans. They also carved a Ganpati from vada pavs. Goli team discovered digital media in 2007 and realized that this will be a huge marketing vehicle in the future. They promoted their brands on Youtube, Facebook before the rest of the brands took cognizance of digital marketing. This resulted in high brand recall where a person who ate their vadapav in Bangalore, connected with the brand through blogs and the brand message across the country was the same. He also quotes another example where he bartered a marketing deal with Marathi movies in his 70 odd stores with the lead pair would shoot a scene at Goli’s store. This was a zero marketing cost again. Be innovative in your marketing in today’s context. For establishing your brand, one doesn’t need to spend lakhs and crores of Rupees. A little bit of jugaad can do it all for you. The company currently employees more than 150 people. They have 300 plus franchisees in 88 cities( 18 states) and have won prestigious awards like Coca Cola Golden Spoon Awards. Goli Vada Pav success has been recorded as a case study in Harvard Business School, IMD Switzerland and ISB Hyderabad. Venky has been invited to these colleges for special sessions with the management students.